TUNEL Assay Kit - FITC ab66108 (previously called TUNEL Assay Kit - In situ Direct DNA Fragmentation) provides complete components including positive and negative control cells for conveniently detecting DNA fragmentation by fluorescence microscopy or flow cytometry. The TUNEL assay protocol uses terminal deoxynucleotidyl transferase (TdT) to catalyze the incorporation of fluorescein-12-dUTP at the free 3'-hydroxyl ends of the fragmented DNA. 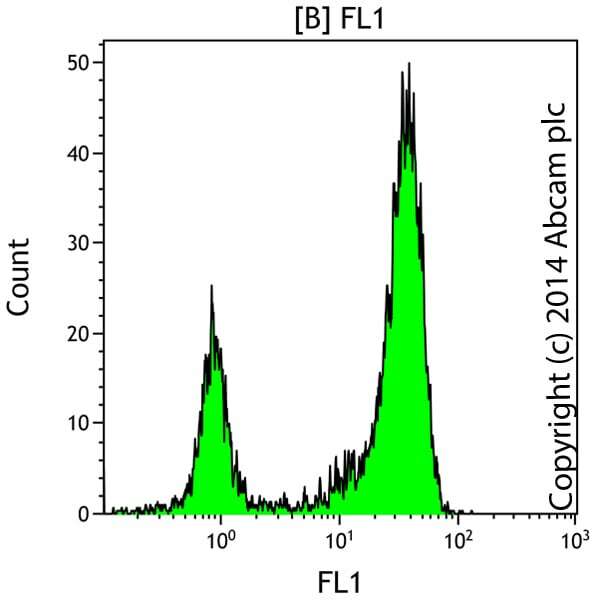 The fluorescein-labeled DNA can then be analyzed by flow cytometry or fluoresence microscopy with Ex/Em 488/520 nm. Propidium iodide is also included in the kit as a counterstain with Ex/Em 488/623 nm. This kit is FITC-labeled (Ex/Em = 495/519nm). To use BrdU-Red (Ex/Em = 488/576nm) as a label, we recommend TUNEL Assay Kit - BrdU-Red (ab66110). Voloboueva et al used TUNEL assay ab66108 to examine the effect of miR-210 inhibition on mitochondrial function and protection against apoptosis. 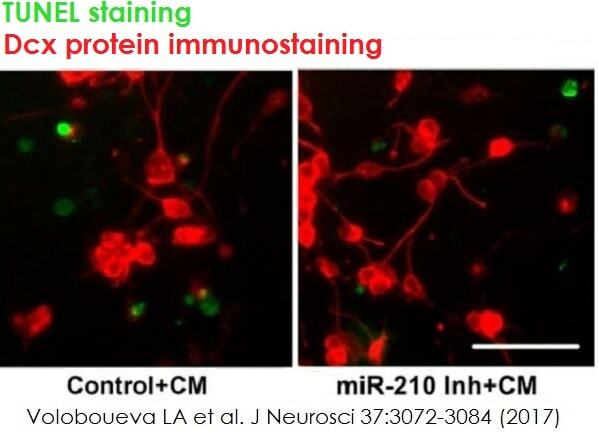 The reduced number of TUNEL+ve green cells in panel F indicates that the inhibition of miR-210 reduces the degree of apoptosis in cells treated with media preconditioned (CM) by proinflammatory activated microglia. Green is TUNEL staining. Red is immunostaining of DCX protein. Representative images are shown. RAW 264.7 cells treated with 2 μM camptothecin (ab120115) for 24 hours prior to staining. RAW 264.7 cells treated with 10 μM camptothecin (ab120115) for 24 hours prior to staining. Customer kindly contacted us regarding ab66108. After storing samples at -20C in ethanol, he is not seeing a pellet after resuspension in step 2 b). He has about 3 million cells harvested initially. Should he be able to see a pellet at this point? The laboratory responded to your inquiry regarding visibility of a pellet after adding the washing buffer. You should be able to see at least a mini-speck of the pellet even after the wash step. One easy thing to do would be to take an aliquot of the cells in the second step of washing and look at it under the microscope. If you are able to see the cells, then they are there. in situ direct DNA fragmantation KIT protocol mentioned cells not tissue, my sample are slides of paraffin embedded tissue can this kit modified to work on tissue slides and examined by fluorescent microscope. We have not tried this protocol on tissue sections, but here is a protocol that the lab has found from another which can be modified to fit into this procedure. A. Tissue Section Preparations: The protocol describes the preparation of formalin-fixed, paraffin-embedded tissue section mounted on glass slides. For information on fixing and embedding techniques, see Ben-Sasson et al., (Methods Cell. Biol. 46:29-39, 1995). Most steps are performed in Coplin Jars. Note: If using fresh-frozen tissue sections, proceed directly to step 7. 1. Remove paraffin by immersing slides in a Coplin jar containing fresh xylene. Incubate at room temperature for 5 minutes. 2. Repeat in a second Coplin jar containing fresh xylene. 3. Immerse the slides in a Coplin Jar containing 100% ethanol and incubate at room temperature for 5 min. 4. Rehydrate the slides by sequential 3-min, room temperature incubations in Coplin jars containing: · 100% ethanol · 95% ethanol · 85% ethanol · 70% ethanol · 50% ethanol 5. Immerse the slides in a Coplin jar containing 0.85% NaCl and incubate at room temperature for 5 min. 6. Immerse the slides in a Coplin jar containing PBS and incubate at room temperature for 5 minutes. 7. Fix the slides by immersing them in a Coplin jar containing fresh 4% formaldehyde/PBS, and incubate at room temperature for 15 min. 8. Wash the slides by immersing them in a Coplin jar containing PBS, and incubate at room temp. for 5 min. 9. Transfer to another Coplin jar containing PBS, and incubate at room temperature for 5 min. 10. Allow the liquid to drain thoroughly and place slides on a flat surface. 11. Prepare 20 µg/ml of Proteinase K Solution (combine 2 µl of 10 mg/ml Protease K and 998 ml of 100 mM Tris-HCl, pH 8.0, 50 mM EDTA) and cover each section with 100 µl of it. Incubate at room temperature for 5 min. 12. Immerse the slides in Coplin jar containing PBS, and incubate at room temperature for 5 min. 13. Transfer the slides to a Coplin jar containing 4% formaldehyde/PBS and incubate at room temperature for 5 minutes. 14. Wash the slides by immersion in Coplin jar containing PBS, and incubate at room temperature for 5 min. B. Detection by Fluorescence Microscopy: 1. Remove slides from PBS and tap gently to remove excess liquid. Cover the cells in 100 µl of Wash buffer (blue cap). 2. Use forceps, gently place a piece of plastic coverslip on top of the cells to evenly spread the liquid, incubate for 5 min. Remove plastic coverslip and gently tap the slides to remove excess liquid. 3. Repeat step 2. Carefully blot dry around the edges with tissue paper. 4. Gently place 50 µl of the DNA Labeling Solution (prepared as in Section IIIB, Step 4) on the cells. 5. Use forceps, gently place a piece of plastic coverslip on top of the cells to evenly spread the liquid. 6. Place the slides in a dark, humidified 37°C incubator for 60 minutes. Note: Ensure high humidity by placing wet paper towels in the bottom of the dry incubator. Antibody Solution 1 assay 10 assays Anti-BrdU-FITC Antibody (orange cap) 5 µl 50 µl Rinse Buffer (red cap) 95 µl 950 µl 7. Using forceps, remove the plastic coverslips. Rinse the slides to a fresh Coplin jar filled with PBS for 5 min. 8. Repeat step 7. Carefully blot dry around the edges with tissue paper. 9. Place 100 µl of the Antibody Solution (Prepared as in Section IIIB, step 8). 10. Use forceps, gently place a piece of plastic coverslip on top of the cells to evenly spread the liquid. 11. Incubate the cells with the antibody solution in a humidified incubator for 30 min at room temperature. 12. Carefully remove the solution from slides. Add 100 µl of Propidium Iodide/Rnase A solution (amber bottle). 13. Use forceps; gently place a piece of plastic coverslip on top of the cells to evenly spread the liquid. 14. Incubate the slides in the dark in a humidified incubator for 30 min at room temperature. 15. Wash the cells by transferring the slides to a fresh Coplin jar filled with ddH2O and incubate at room temperature for 5 min. 16. Repeat Step 15. 17. [Optional] Add a drop of anti-Fade solution and cover the treated portion of the slide with a glass coverslip. 18. [Optional] Seal the edges of the coverslip with rubber cement or clear nail polish. 19. View slides as soon as possible using FITC and rhodamine filters. Apoptotic cells will exhibit strong nuclear green fluorescence. All cells should be stained with PI and exhibit strong red counter staining. dear technical team i had a previous inquiry with number:CCE 4458713 about the kit of direct DNA fragmantation assay kit, i need you to provide me with the detailed protocol (technique) of this kit application on paraffin sections on postive charged slides. with best regards. Thank you for your inquiry and your patience while we looked into this further. For ab66108, the kit components are optimized for usage on cells. If using tissue sections, you will not be able to get a full 50 assays from the kit because you will run short of reaction buffer. 1. Immerse slides in xylene (or xylene substitute) for 5 minutes at room temperature. Repeat using fresh xylene for second 5 minute incubation. 2. Immerse slides in 100% ethanol for 5 minutes at room temperature. Repeat using fresh 100% ethanol for second 5 minute incubation. 3. Immerse slides in 90% ethanol for 3 minutes at room temperature. 4. Immerse slides in 80% ethanol for 3 minutes at room temperature. 5. Immerse slides in 70% ethanol for 3 minutes at room temperature. 6. Immerse slides briefly into 1X PBS and carefully dry the glass slide around the specimen. Do not let the tissue specimen dry out during or between any step! ** At this point it may be helpful to encircle the specimen using a waxed pen or a hydrophobic marker. 1. Dilute enough Proteinase K (STOCK: 2 mg/ml in 10 mM Tris pH 8) needed 1:100 in 10 mM Tris pH 8. 2. Cover the entire specimen with 100 μl diluted proteinase K. Incubate at room temperature for 20 minutes. DO NOT OVER INCUBATE. 3. Rinse slide with 1X PBS. 4. Gently tap off excess liquid and carefully dry the glass slide around the specimen. 1. Dilute Reaction Buffer (green cap) as needed 1:5 with dH2O. (NOTE: This buffer does NOT contain nucleotides or enzyme). 2. Cover the entire specimen with 100 μl of the diluted Reaction Buffer. Incubate at room temperature for 10 to 30 minutes while preparing the staining reaction mixture. 3. For making staining solution, follow K402-100 kit protocol. 5. Immediately apply 50 μl of staining solution onto each specimen. 6. Cover the specimen with a piece of Parafilm cut slightly larger than the specimen. HINT: Folding up one corner of the Parafilm cover slip will aid in its application and removal. 7. Place slides in a humid chamber and incubate at 37C for 1 to 1.5 hours Note: incubation times at 37C may need to be adjusted to longer or shorter periods depending on the characteristics of the tissue supplied by the researcher..
8. Remove Parafilm cover slip and rinse slide with 1X PBS. 9. Repeat the rinsing step. 10. Gently tap off excess liquid and carefully dry the glass around the specimen. 11. Dilute PI/RNase staining buffer 1:5 in PBS & apply 50 ul of diluted Propidium Iodide/RNase A Solution (amber bottle) onto the specimen. 12. Incubate in the dark for 30 min at room temperature. Thank you for contacting us. This kit will work fine with the samples you describe. Can be it offer a testing discount for each kits If the user would like to test the kits, Annexin V-FITC Apoptosis Detection Kit (ab14085) and In situ Direct DNA Fragmentation Assay Kit (ab66108), on yeast cells by IF? I discussed with my colleagues from the Scientific Support Team about the use of these kits in yeast and we agreed that the kit that is likely to work is the In situ Direct DNA Fragmentation Assay Kit (ab66108) but not the Annexin V-FITC Apoptosis Detection Kit (ab14085). In order to link the discount code to the Abreview that will be submitted, could you please send me the email address as well as the name of the institute of your customer? This code will give your customer 1 free kit or value off of order before the expiration date. To redeem this offer, your customer must submit an Abreview for yeast and include this code in the “Additional Comments” section so we know the Abreview is for this promotion. The submission of the Abreview is sufficient for the discount code to become active. Remember, we publish both positive and negative Abreviews on our datasheets so please submit the results of your tests. The code will be active once the Abreview has been submitted and can be redeemed on a future order. Thank you for your enquiry and your interest in our products. The two kits (ab66108 and ab66110) are mainly used for cells analyzed by flow cytometry. Currently, we do not have specific kits for tissue samples (for DNA Fragmentation) but I would advise you and your customers to check our catalogue regularly since we add and publish new products every day. Apologies! If you need any further assistance in the future, please do not hesitate to contact me.